When designing a beachfront home, you must consider how you want to compliment the beauty of the beach and the house, while also considering what kind of staircase to add on the exterior of your home. 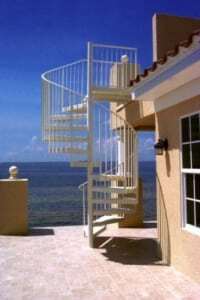 Because of this, many people over the years have turned to a spiral staircase as an exterior addition to a beach house. 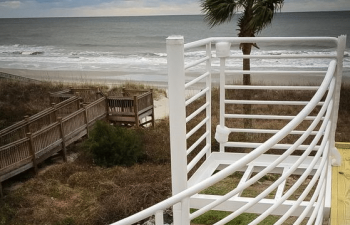 In this week’s blog, we take a look at two of our favorite beachfront projects, and how spiral staircases can compliment the beautiful views of the beach. 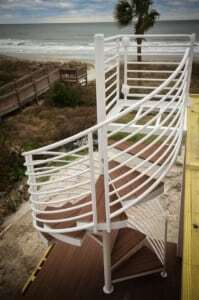 Our first featured project is a white metal spiral staircase installed for a residence in a coastal town. This beautiful staircase provides unobstructed views of the ocean while still encompassing the coastal feel of the home. Our second featured project is an all white spiral staircase for a home that was right on the water. As shown in the slight glimpse of the home, there is a Mediterranean style that the homeowner wants to continue outside. Our team worked with the homeowner and created this picturesque, airy spiral staircase that compliments the ocean and the residence. Visit our spiral staircase gallery for additional product photos and details. 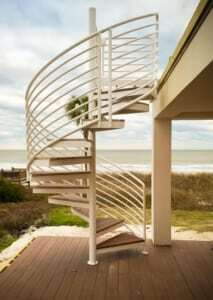 A beachfront spiral staircase can transform the exterior of any coastal home. With over 30 years of experience in constructing spiral stairs for both residential and commercial buildings, we produce industry-leading spiral systems of all styles and materials, including wood, steel, aluminum, and more. Contact us to discuss your next staircase project.